Here’s a screenshot of the current version of a dashboard that I’ve built for geth.exe using the Nethereum .NET integration libraries for Ethereum. (click the image to enlarge it). Yes, it is a .NET desktop WinForms client. The app uses a background task to update the Node State section of the form on a timed interval. It also knows how to send Ether (with or without extra data) between two accounts. 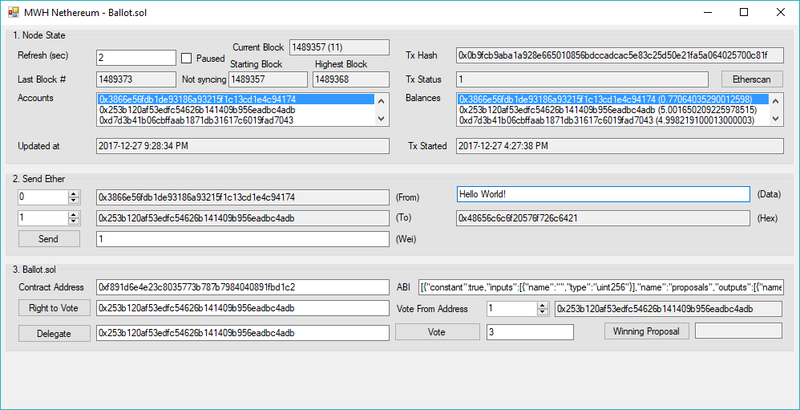 The send Ether integration assumes you have more than one account configured in your Rinkeby geth.exe node. The app will prompt for your password the first time it is required. It also has direct integration with an existing deployment of the Ballot contract. The Ballot integration assumes the existing contract address is on the Rinkeby Ethereum network. In terms of failover, the app tests to see if geth.exe is running and will automatically connect (and reconnect) if geth.exe isn’t already running on Rinkeby. It also checks to see if the node is syncing and if so, the background task pauses until the sync completes. This is an early version of an article that is intended to help developers who have a basic knowledge of the Ethereum blockchain platform and want to learn how to program against the Ethereum platform using the Nethereum .NET libraries. I’ll add more to this article at a later date but, for now, I’m using it to publish a series of 10+ .NET C# examples of how to use the Nethereum libraries to perform the most common task against the Ethereum blockchain platform. I realize that this is a fairly crude way to publish code examples. Any suggestions for a better approach will be appreciated.